When was the last time you had tabouli? It was certainly ages for me. But the other day I had lots, and I mean lots, of parsley in the fridge and tabouli is the best thing I know to use up parsley, so tabouli it was. My cousin, Michael, has been very successful growing parsley. I asked for a large bunch but somehow that translated into a bag full. With it, I made up enough pasta sauce for three nights and still had plenty so we had to look further afield to find a use for it. Tabouli sprang to mind. This recipe is from Natural Fibre Cooking by Karen Plageman. Pour 2 cups of boiling water over cracked wheat or burghul. The recipe calls for cracked wheat and I prefer it as it gives a crunch to the salad. In the 70’s, we could readily find cracked wheat but it is very hard to find in Perth these days so I had to use burghul. (For those who don’t know, burghul is precooked ground wheat.) If you can get cracked wheat, all the better but, if not, burghul will do just fine. If using cracked wheat, soak it for one hour and, if using burghul, soak it for 20 minutes. Pour the soaked grain into a sieve and allow to drain whilst you make the rest of the salad. When ready, squeeze the excess water out of the grain. The recipe calls for ⅓ cup of oil and ⅔ cup of lemon juice but go easily at first . Maybe start with ⅓ cup of lemon juice and a splash of olive oil and see how it tastes. It all depends on the variety of lemons and how acidic they are. It is best to use a little and add more if desired. Add salt and pepper to taste. Tabouli tastes great served with lamb marinated in lemon juice, olive oil, garlic, oregano, rosemary and coarsely ground black pepper. This entry was posted in Eating your bounty, Salads, Tomatoes, Vegetarian, What's for dinner? 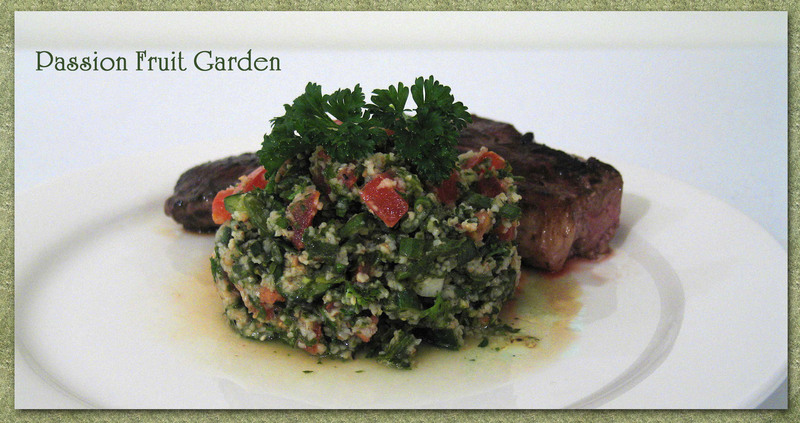 and tagged Bulghur wheat, Cracked wheat salad, Tabbouleh by Glenda. Bookmark the permalink.